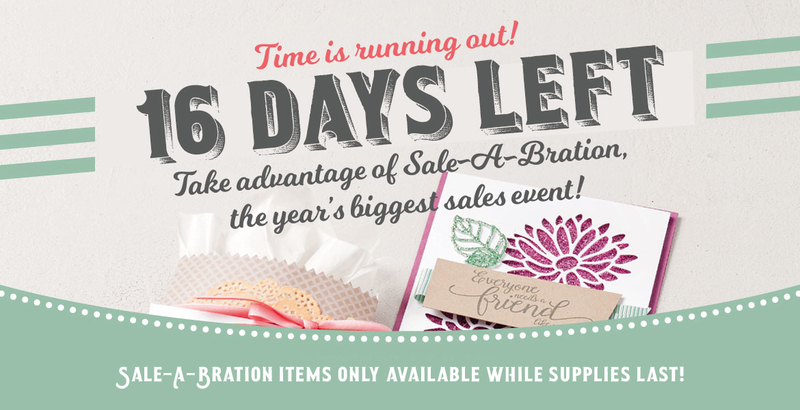 There are only 16 days left to take advantage of Sale-A-Bration! Have you gotten everything on your wishlist? These exclusive Sale-A-Bration products will not be available after March 31, so hurry and get them before they're gone forever! For every $50 you spend (before shipping and tax), you get a FREE item of your choice from the Sale-A-Bration brochure. That means it's the perfect time to purchase those products you've had your eye on while earning more products for FREE. Remember to use this month's hostess code Z66MCKXN for an additional FREE gift from me! Have you been thinking about joining Stampin' Up!? Well, what are you waiting for? It's, absolutely, the best time of year to join Stampin' Up! If you join my team during this year’s Sale-A-Bration, you have a fabulous opportunity to stuff your starter kit with TWO extra stamp sets, any price, from any catalog (with the exception of Sale-A-Bration sets and bundles)! And, you get to customize your starter kit with $125 worth of product for just $99! Plus, the kit ships for FREE! But wait, there's more! When you join my team you will be a part of a large online community of demonstrators that support each other every step of the way. And, oh yeah, we have lots of fun, too! What are you waiting for? Join my team today!